Johnnie Faye DeBusk, 86, of Sherwood passed away September 16, 2017. She was born in Quitman, Arkansas on April 14, 1931. She was a member of First Baptist Church of Gravel Ridge for over 60 years and was a quilter with the Quilters and Dollmakers group. She so enjoyed working outside in her yard, was quite the baker with her baking goods, and loved her grandchildren. She is preceded in death by her husband of 56 years, Oscar DeBusk; her parents, John Ussery and Mrytle Condray Ussery; her son, Gary DeBusk; two brothers and four sisters. 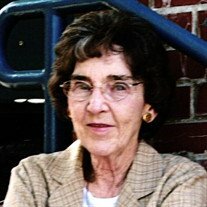 She is survived by her daughter, Phyllis Clamp (Dwight); four grandchildren, Johnathan DeBusk (Karla), Shannon Alig (Eric), Mark Clamp, and John Clamp (Lacey); six great-grandchildren, Trevor DeBusk, Erin DeBusk, Osric Alig, Sabine Alig, Emma Clamp, and Owen Clamp; and her sister, Arlene Stacey. The graveside service will be held 10:00 A.M. Wednesday, September 20, 2017 at Arkansas Memorial Gardens, 8507 AR-161, North Little Rock, Arkansas 72117.